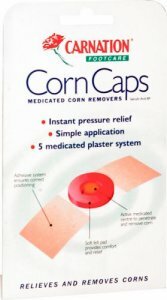 Carnation Corn Caps combine a measured dose of Salicylic Acid Ointment with a soft felt corn ring to relieve pressure whilst the corn is treated. Salicylic Acid loosens the intracellular cement holding hardened skin together allowing it to flake away, softening and loosening the nucleus to allow clean removal. Carnation Corn Caps have a self-adhesive strap that makes them easy to apply and hold firmly in place. A ten day treatment course is usually fully effective. Over 15 years: a medicated dressing is placed over the corn and left in place for 2 days then removed. The area is cleaned and dried and a fresh corn cap applied every 2 days. After the sixth day the corn is removed and any loose skin is scraped away. If the corn is not easily removed further corn caps can be applied changing every 2 days up to a maximum of 5 corn caps. Children under the age of 16 years, pregnant women and people with severe circulatory disorders should see medical advice before use. Adhesive dressing with felt ring containing paste of: Salicylic acid 40 % w/w.